When Age of Sigmar launched it was heralded as the most refined and accessible entry into Warhammer to date. It trimmed a lot of the fat from Warhammer Fantasy Battles and spawned from it a new fantasy game that was quicker to play, more streamlined and more enjoyable. I cannot contest this, I’ve played enough Age of Sigmar over the last couple of years to know they’ve succeeded. 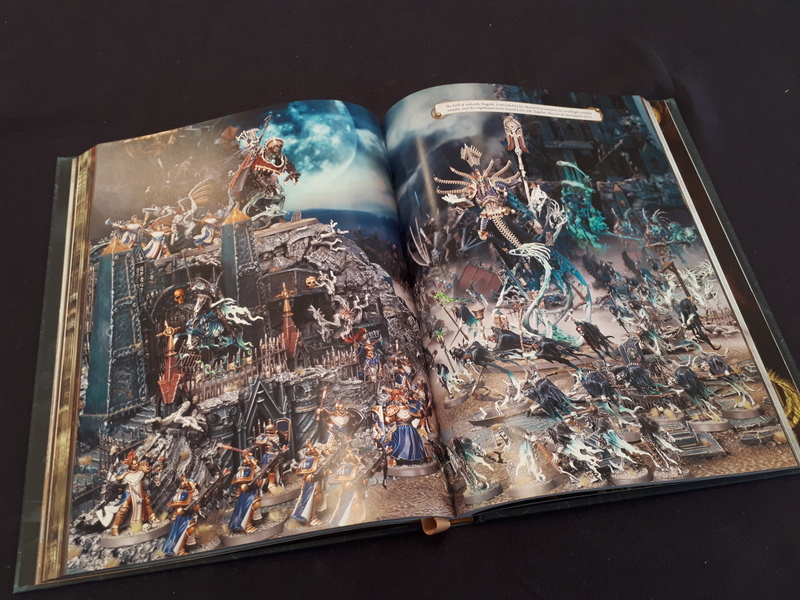 However, it seems that Games Workshop have sought to refine the game further with Age of Sigmar 2nd edition. We’re going to see how they’ve gone about this and see if the game may remain sleek and approachable. Or might the game be starting to swell and bloat already? 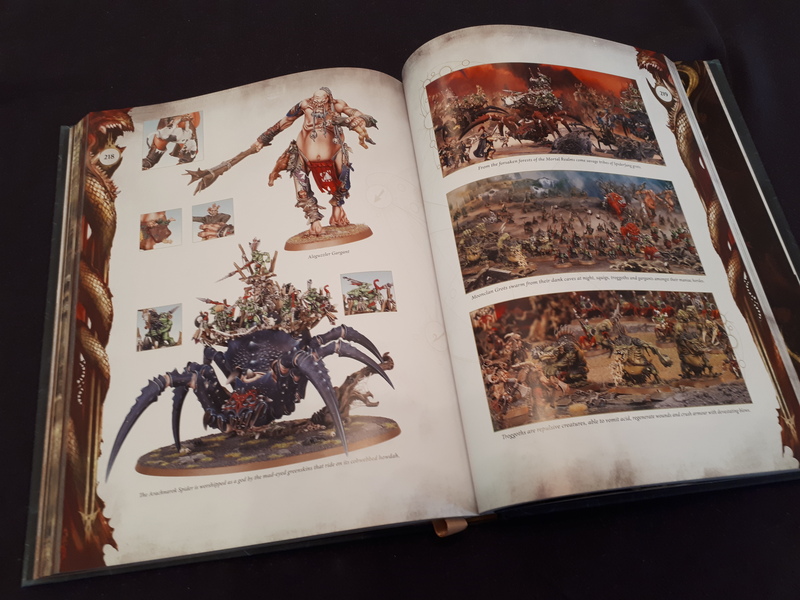 Releasing alongside Soul Wars, Games Workshop looks to add new elements with Age of Sigmar 2nd edition as well as work to improve existing systems. 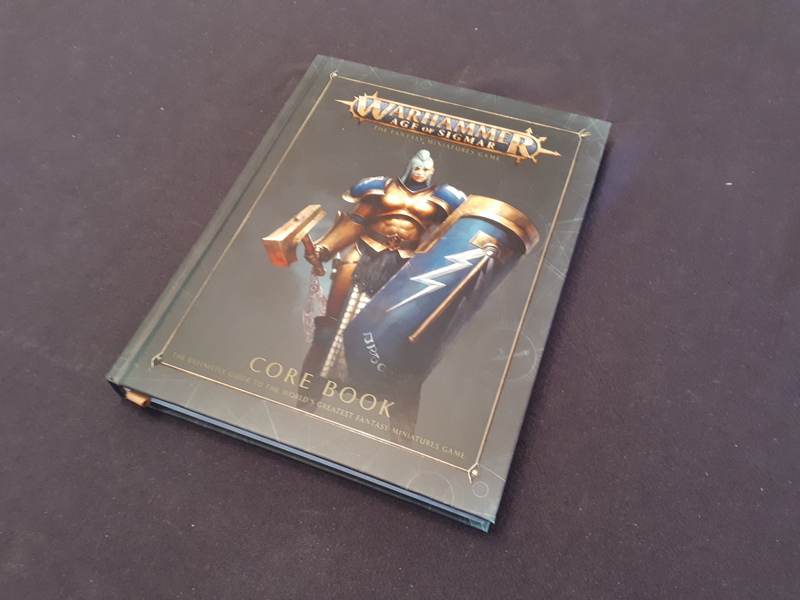 If you’re curious about the Soul Wars box you can read more on it via our article here. But here, we’re going to get stuck into some of the changes via the brand new core rulebook. With the amount of games I’ve played of the original Age of Sigmar up to now I can certainly call out one of the things that utterly boiled my blood from time to time. Namely, the turn prioritisation system. I found it infuriating that my well-laid plans could be completely scarpered by a single roll at the start of the game round. Only for them to double-turn and just pile on the hurt twice in succession. Thus, leaving me battered and spiralling towards defeat. 2nd edition doesn’t strictly make swathing changes to this, but at least double-turning is now slightly less-likely to happen. I believe this may be a system nabbed from the Middle-earth Battle Game ruleset. if two players draw on the roll off for priority, whoever got first turn previously may determine who goes next. This provides at least a thin layer of tactical flexibility and I find it hugely preferable than the current system. It’s never going to be certain, but this feels a little more accommodating. One of the more grandiose changes in this edition is the inclusion of Endless Spells. Giving wizards and sorcerers an exceptionally more potent arsenal, Endless Spells are entirely different from regular spells. Upon casting these spells, they actually warrant their own models. These models are moved at the start of every battle round after determining who goes first. You and your opponent then take turns to pick a spell to move, starting with the player that is going second for the round. Players can move enemy spell models as well as their own. This is a nice touch and will likely have players carefully consider which spells to cast in their current situation. Whether there’ll be a desperate last call to eliminate a perilous foe or simply for the opportunity the wreak havoc in enemy lines. I’m excited to see what sort of lunacy these spells can whip up. I’m exceptionally happy that wizards are now given extra levels of power and utility on the battlefield. Let’s also not forget that wizards are now general more useful with spell unbinding now sitting with a 30″ range! Magic has become even more powerful, but also a little easier to stop. Summoning has also seen a vast change this time round. In Matched Play you no longer set aside army points for your summoned units. Instead, as has been seen in some of the newer armies, you obtain resources during the game to bring them in. Similar to the Maggotkin Contagion Points which are built up throughout the battle and can be spent on summoning units. I have some concerns about this as to me it feels as though things could snowball. Does this mean if one army is performing particularly well on the battlefield they can generate more units? Where does balance come in? It sounds thematic for your armies, sure, but I want to get some more games in to see how this folds out. I’m always one for nice, fluffy rules, but this one gives me the something of a furrowed brow. Something completely fresh to Age of Sigmar 2nd edition is the inclusion of Command Points. Each Hero Phase you generate one Command Point whilst also gaining one for each warscoll battalion at your command. This’ll likely ring bells for 40K players with a similar system in 40K via the use of detachments. These points can be spent on powerful command abilities such as to re-roll a charge for a unit close to your general. There’s even the power to inspire a nearby unit to not take battleshock tests in the current phase. They can also be spent on command abilities exclusive to certain warscrolls. I’m happy to see Command Points loosely translate into Sigmar. Hopefully, it promotes the use of more structured armies and endorses lore-driven armies as it does in Warhammer 40,000. Yet another element I’m exceptionally happy to see in the new edition is the inclusion of the realms themselves. You can now wage battles in the varying realms in the Age of Sigmar 2nd edition incorporating their own rules. Coming so freshly from the Shyish-drenched Malign Portents, this is a logical step and can add some wonderful flavour to games. For instance, the Realm of Ghyran has its own command ability which can allow nearby heroes to summon brambles from the ground, inflicting mortal wounds on foes that charge into allied units. There’s even rules for terrain bespoke to each realm which further embellishes the concept of fighting in them. With so much rich and in-depth lore in this setting it’s fantastic to finally see it being realised and brought into the game itself. All of this on top of new battleplans across varying modes of play, too. There’s also new open war tables for objectives, twists, ruses etc. The numerous new rules feel like they do add new levels of depth to Age of Sigmar. However, with 2nd edition adding a myriad of new mechanics and gameplay elements I fear that the accessibility may wane. Whilst we’re nowhere near the level of tediousness of Fantasy Battles, I’m hoping that the “jump in and play” nature of Sigmar is something that’s still nesting at the core of the game. There’s numerous smaller changes and updates I’ve not included in this article, but I thought to cover the biggest chunks. Piling in, Look Out, Sir, shooting, also saw some changes which are covered on the Warhammer Community site. I can say with at least some relative comfort that in my eyes Age of Sigmar didn’t need fixing. However, a lot of these changes are most welcome. Sure, the new rules and elements do seem a little bit daunting to get used to at first. I’m hopeful after a few more games these rules will ease into normalcy. I’m confident that in due time it’ll feel like they’ve been there to whole time as a natural fit into the game. If you’ve been swerving away from the game due to fears of it being a “dumbed-down” tabletop game I advise you correct your course. Age of Sigmar 2nd edition has propelled the game from being the fresh-blooded greenhorn into a battle-born warrior. The battles will be deeper, richer and with luck, certainly bloodier. Thanks for reading, folks. As always keep checking back to the site for more updates and don’t forget to pop by our Facebook page too so you don’t miss out on anything else! Admittedly, it’s early days but there’s enough information at hand to garner what we can and can’t expect. There’s still plenty to learn, though.